We often justify our technology purchases in the name of ‘business’ or ‘productivity’, but, honestly, who doesn’t want to be able to use that same tech to control a robot? We have great news for you fellow robot aficionados. 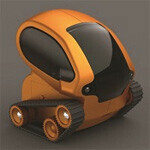 DeskPets is now offering Tankbots, a toy that can be controlled with your iPhone, iPad, or Android powered device. In addition to being controlled with a smartphone, they can also be put into “Autonomous Personality Mode”, which allows the Tankbot to use infrared technology to avoid walls and obstacles. For multi-player fun, that same infrared system can be used in battle mode to fire shots at an enemy Tankbot, although we think it’s quite obvious that any battling between these guys in the real world is going to consist of smashing them into one another. These little bots have a built in USB charger that give you 15 minutes of fun on a 40 minute charge. They come in several colors and are available at Toys ‘R’ Us, Brookstone, and Radio Shack for only $24.99.